This gorgeous vanity light features a clean design with metalwork finished in brushed nickel and etched glass. 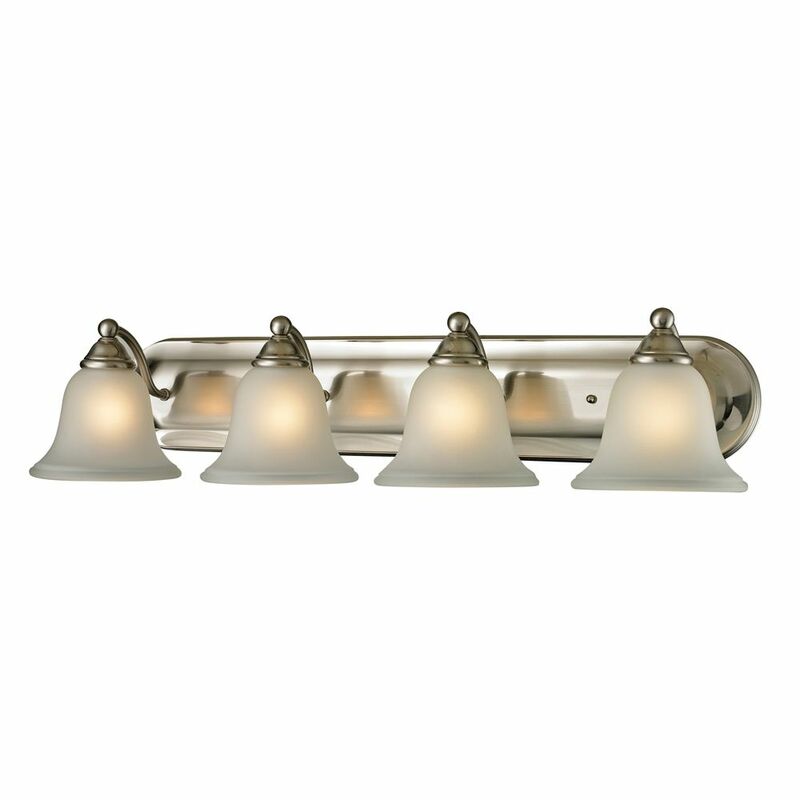 This 5-Light Polished Brass Bath Light Bar from the Cabernet Collection offers a trendy solution that is sure to satisfy all your lighting needs. This bath bar combines unique styling and excellent quality to create the perfect bathroom centrepiece. Accented by a polished brass finish, this functional yet elegant fixture will add a refreshing element in various decor settings. This Commercial Electric 1 light bathroom sconce consists of a durable construction with a simple, classic style that brings a new look and feel to any bathroom. The traditional oil rubbed bronze finish is complimented by a tea stained glass shade and easily matches similar bathroom fixtures. The perfect vanity design - the Dolante collection is both timeless and modern. Ostentatiously crisp white shades rise from a sparkling chrome or satin nickel bar in an effortless statement of both class and gentility. Mounting hardware included for quick installation. Curvaceously cut shades are audaciously pointed downwards in a display of omniscient illumination. The slender arc of the smooth arms demonstrates the fluid structure of the design, making the Dorado collection a classic representation of artistic mastery. Mounting hardware included for quick installation. 4 Light Bath Bar In Brushed Nickel With Led Option This gorgeous vanity light features a clean design with metalwork finished in brushed nickel and etched glass.